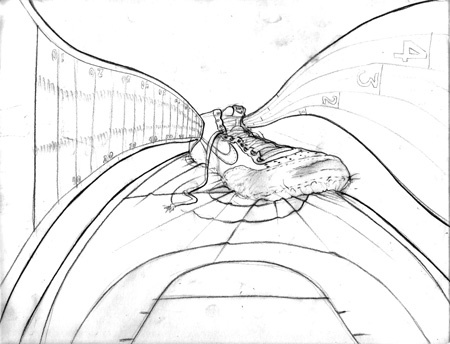 Here’s a frame I developed for the opening of a Nike soccer animation we have been working on. I like the way it turned out. More later on this animation. Here’s a logotype I created for a charity my daughter started recently. The word is Swahili for “Freedom”. I won’t tell you what the word is, because I have been wondering if this logo is even legible. What word does this spell to you? Feel free to leave a comment. 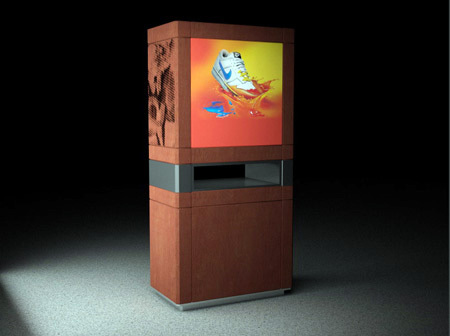 I was hired by Digital Pond recently to design out a shoe recycle bin for Nike. Nike’s current bin is a cardboard box with a hole on top and a backboard. Not compelling, and it shows a lack of investment in a worthwhile initiative. One of the requirements was that the new bin should not look out of place in a Nike retail environment. It had to look nice in other words. Another requirement was that it should have a media component to it. I didn’t have much time to spend on this as I was given the go ahead the week my wife gave birth. But I spent a day or so and created 3 options which I thought had some potential. The graphic is placeholder. This version is the most playful of the bunch and takes cues from the Nike Sportswear stores and the common use of cubbies made of wood. All 3 cubbies spin, and have a hole in the top corner. 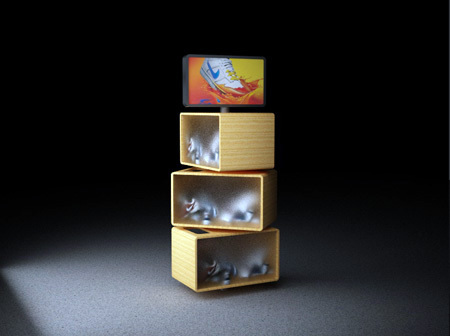 The cases provide a way of seeing what’s inside without smelling what’s inside. This option includes some curves which creates a more energetic and sporty look. The dark wood is used in a number of Nike environments including Sportswear stores and the House of Hoops. Lastly, this version is just clean, probably the most stately of the bunch, and uses the wood with several reveals to fit into the Nike aesthetic. 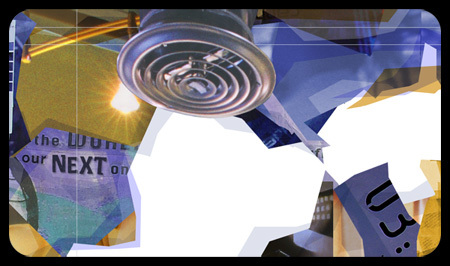 Something else I was hired to do was work on some creative visuals for the Reuse-A-Shoe initiative. 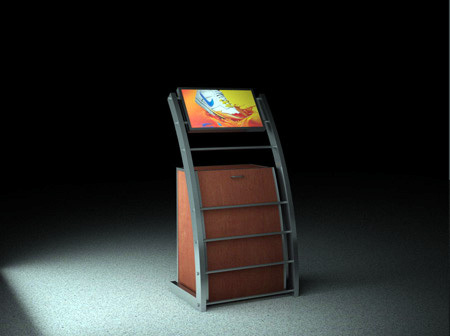 These would be graphics and/or animations which could be used at retail or TV/web. 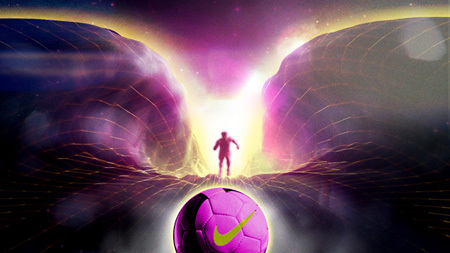 All of these concepts take inspiration from some existing visuals done for Nike ID. 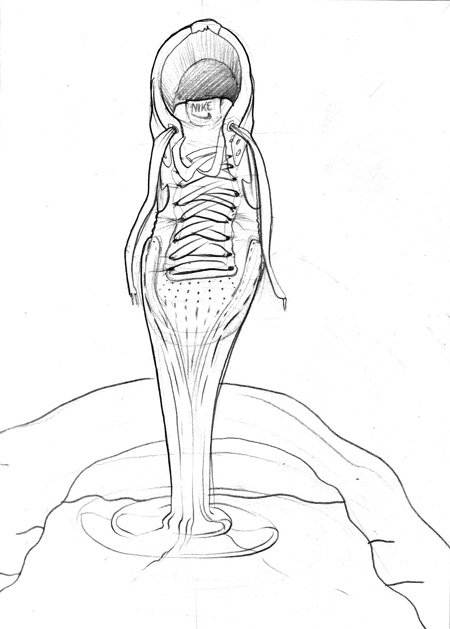 Concept: shoe coming apart (fully realistic) and turning into 3 different athletic fields. Concept: An outdoor court is built using the soles of old shoes. 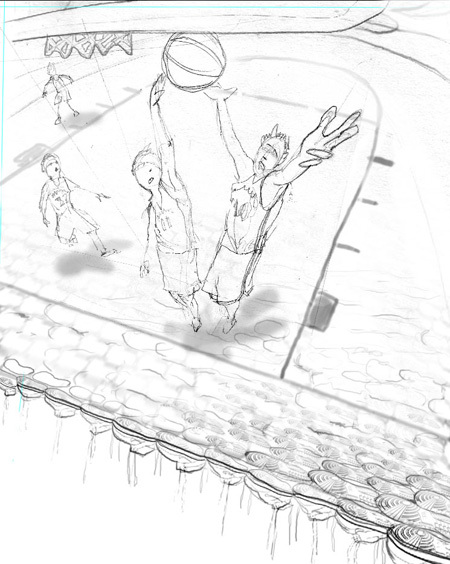 Real people would be composited onto this, and below the court would be empty. This concept takes the most direct influence from the NIKE ID graphics that were existing. One of them has a shoe dripping color into a swirly pool of paint. This idea would be similar – but instead the shoe would be melting into an athletic court. I don’t believe any of the sketches were presented to Nike. 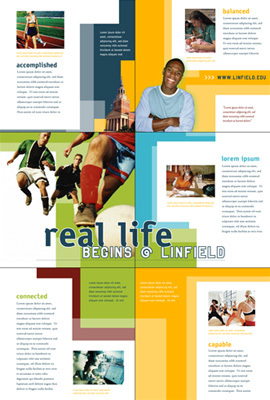 I was hired by The Creative Company to redefine the branding for Linfield College in McMinnville. Creative Company at the time had no creative lead, so I basically directed myself regarding creative approach. CC provided me some historical background, photos, and a lot of research which was gathered through focus groups and surveys which were conducted with current students, potential students, as well as faculty. The overriding goal of this project was to create a vibrant, contemporary and energetic face for the college. Linfield has a lot of history, and the collateral which the college produced in the past had been very conservative/dry. They were looking to attract more students, and this new Identity hit the mark. 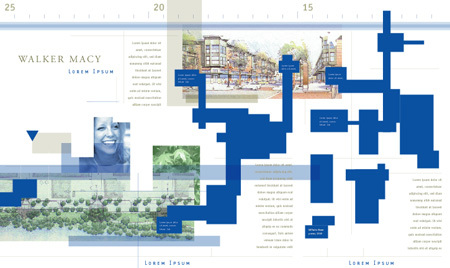 Results from the project can be found at the Creative Company’s website. They also won several awards for the Linfield work. 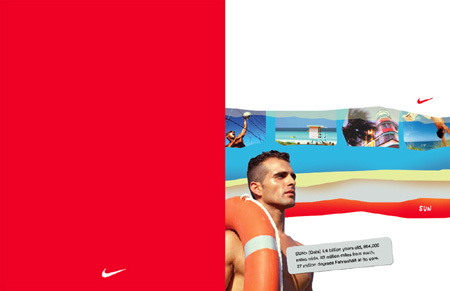 Here’s a project I worked on in my first stint in Nike Brand Design. 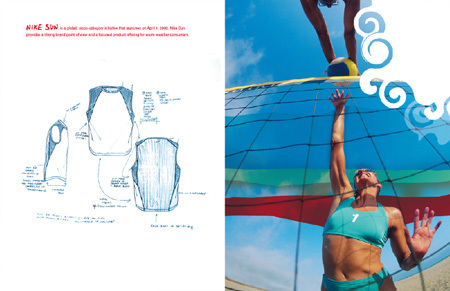 Style wise, this marketing book was pretty wide open and the product focus was to be a new line of sun/surf apparel which Nike had not tapped into yet. As you can see the overall style is warm and pulls lots of inspiration from the vibrant colors of Miami Beach. I used an illustrative look which I felt helped convey the sandy warm feeling and flowing, wavy organic graphics atop to give everything movement. 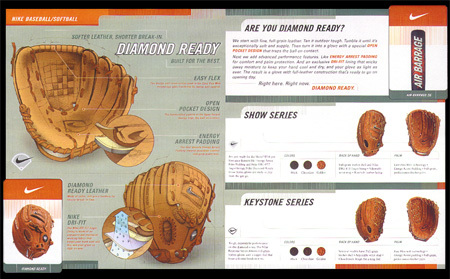 I designed this fold up, double sided “brochure” while working in the Team Sports Equipment department at Nike. 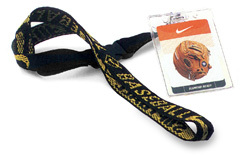 The entire thing folds to the size of a name tag, and fits into a lanyard pouch which is used by the Nike sales force at tradeshows. Tim Clark art directed me on this project, and Bob Brinemeyer (have no idea how to spell his last name) created the illustrations. 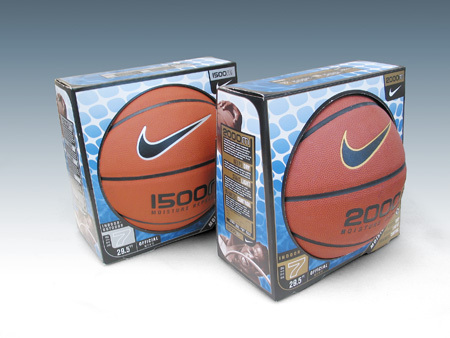 Some packaging I designed while working at Nike in the team sports equipment department. 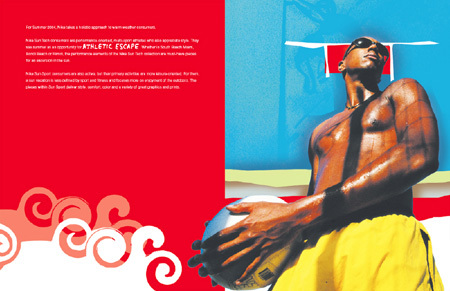 Here’s a poster I worked on while while freelancing at Nike. 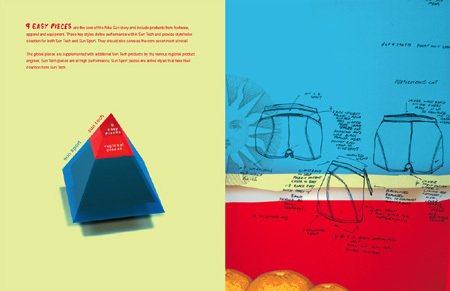 Dane Johnson was the lead designer from Nike, and he asked me to create the photo montage on the right side. 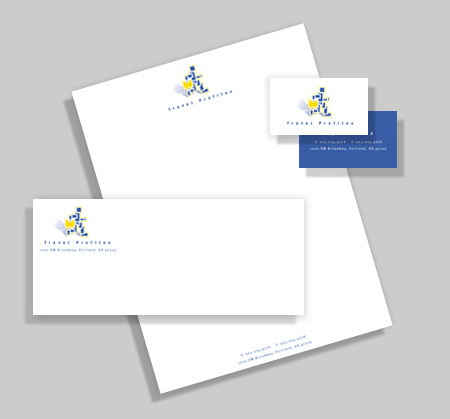 While at ZCom, one of our clients needed a new logo, so I was tasked with the project. Below are a few of probably 30 different comps I created. Here’s a project from my second stint in Nike Brand Design. I developed a logo, signage, and some graphics to wrap onto a van for this 3 on 3 street soccer initiative focused on getting inner city kids active. and we basically just covered the van with Duct Tape. 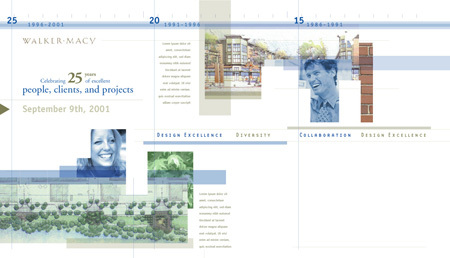 Julie Freeman was the AD on this project. This is also one of the first projects where I rendered something in 3d in order to help visualize the medal, as well as to help the manufacturer to understand the construction of the piece. 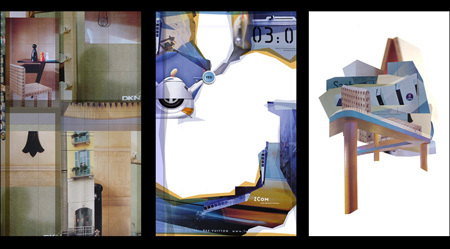 While working in brand design at Nike in 2003-2004, most of my time was spent on the Nike Speed initiative. 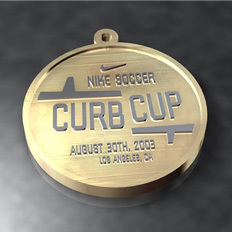 At the time, this was the largest initiative Nike had ever undertaken. 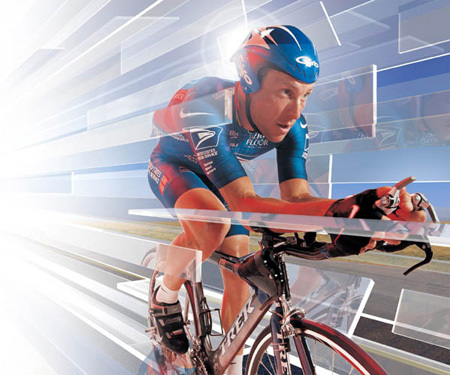 The Speed campaign revolved around the 04 summer olympics. 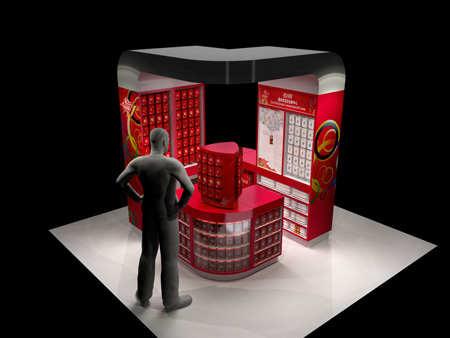 We worked on collateral, packaging, retail displays, events and more. I worked under Heather Amuny and Julie Freeman at the time, as well as David Odusanya. The visual style of Speed was a red stripe and lots of glass shards. 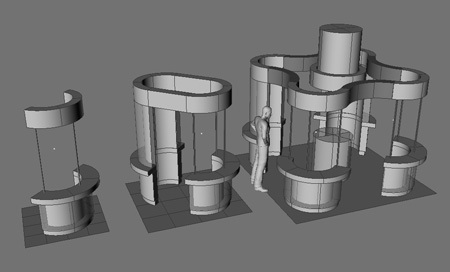 Below are a couple examples of some of the 3d work I did during that time. More to post on this. 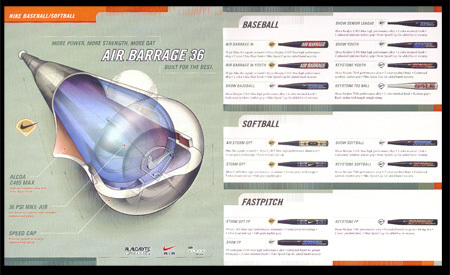 This is the first project I ever worked on for Nike. 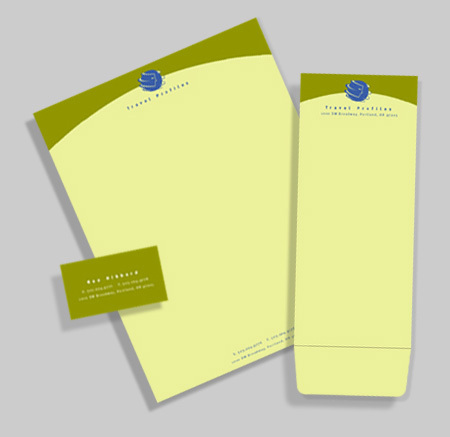 I was hired through Creative Assets on a 2 week assignment designing bag graphics. When I started, the lead designer in the category (Jeff Dey) was out on vacation. This was one of the most vague projects I’d ever been given. I quickly realized that working at Nike required lots of initiative and self direction. I had almost nothing to go off of, other than a generic backpack and duffle bag. One design was to be “retro” and the other “contemporary”. I scoured a bunch of servers for assets, logo’s, etc and actually ended up with probably 40 rough comps for graphics by the time Jeff got back into town. Don’t know if any of these were selected. Can’t remember actually. Whatever the case, I had shown some potential I guess as they kept me on as a “permanent freelancer.” I stayed a few months and then took the job at ZCom. 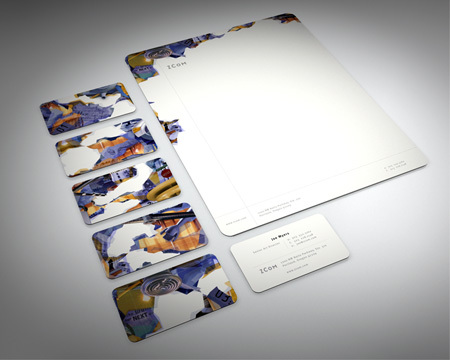 I worked on this project while freelancing as a graphic designer in Nike Brand Design. 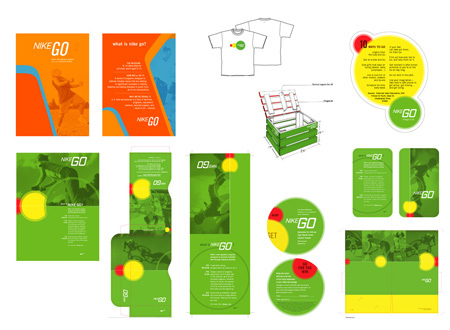 Nike Go is an initiative which seeks to get kids more active. 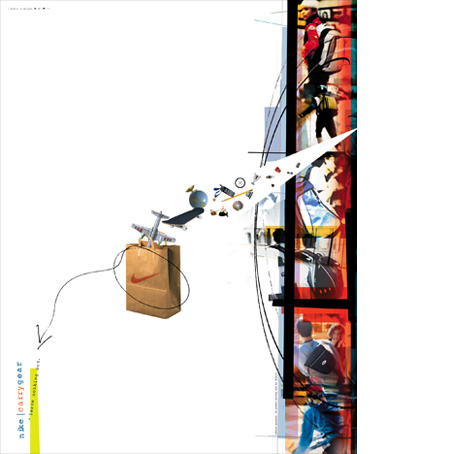 I was given this project by one of the producers at Nike, and my only direction was to go off a pre-existing sticker which was shaped sort of like a raindrop. The colors were basically set, as was the actual GO logotype. Mitch Morse designed the sticker, and at the time this project started he was out of town, so I started designing a bunch of collateral including press folders, VHS covers, stickers, table tents, etc. Some of what I designed is below. Then Mitch came back into town, and informed the PM and I that we were not to design off of this old sticker. Instead he wanted to use a stoplight for inspiration. Red, yellow, green and circular shapes. So I worked on a new look based on this new direction, and basically produced a rough poster concept which was signed off on, and then I left on vacation. Kate Zimmerman, a fellow freelance designer, took over on the project, and by the time I was back from vacation most of hard work was done. Kate did a great job of taking the rough elements I tossed together, and finessing them together into a nice cohesive campaign. 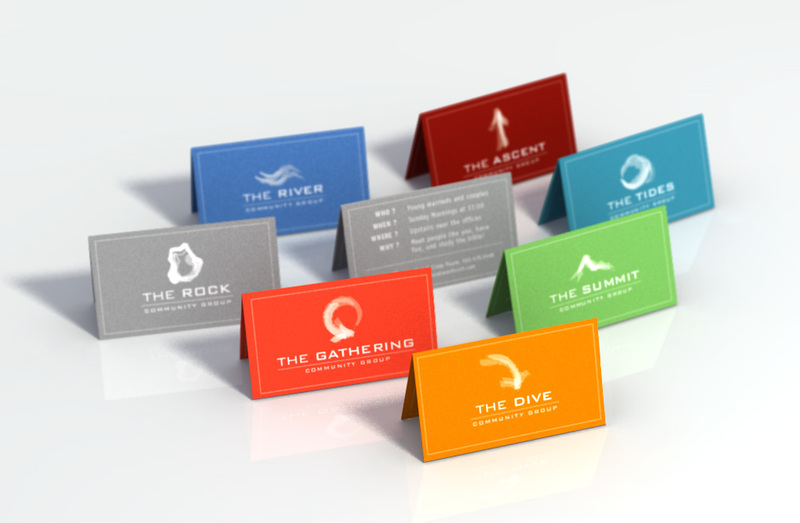 After I returned the only thing left to accomplish was to create a bunch of event graphics. 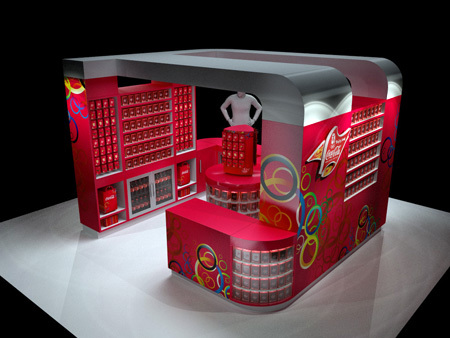 Building wraps, tee shirts, signage, etc. 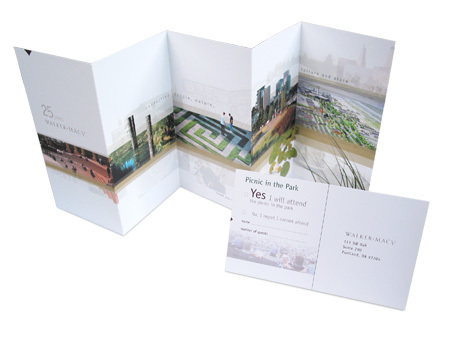 This was also one of the first projects ever where I used a 3d program for some concepting/visualization. I rendering out a bunch of floating Go balls on the lake at the Nike world headquarters.